Tiramisu is an Italian dessert typically made from ladyfingers, espresso coffee, mascarpone cheese, eggs, cream, sugar, Marsala wine, cocoa and rum. 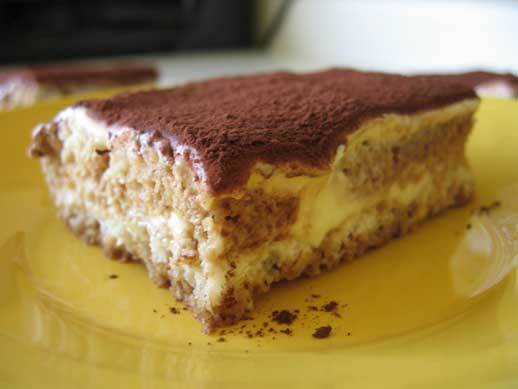 The name tiramisu means “pick-me-up”, referring to the two caffeine-containing ingredients, espresso and cocoa. The ladyfingers are sprinkled with or briefly soaked in a mixture of the coffee, rum, and sugar. They are then layered with a mixture of mascarpone cheese and a custard made from egg yolks, Marsala and sugar, known as zabaglione. Cocoa powder is then sprinkled on top. A couple of weeks ago, I got together with my good friends Mie and Teresa to make tiramisu. For many years, Teresa has been making her family’s recipe for tiramisu and, since she is a professional at it, I thought I’d learn a thing or two. I have to admit that I have made Teresa’s recipe before but it is just not the same. So what is the difference? Well, I think it is a few things: one, I love to eat other people’s food; two, anything made with love is good; and three, lots of alcohol. Instead of using rum, try Martini or Frangelico. Since Teresa’s family recipe is a secret, I cannot publish it. 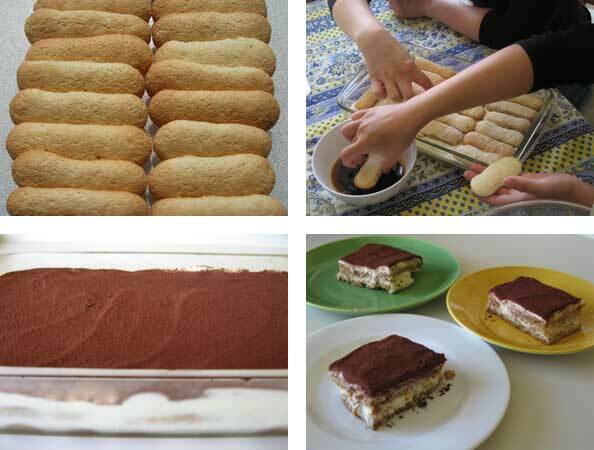 I have however included a recipe for savoiardi/lady fingers. I made these for our tiramisu, rather than buying them from an Italian grocery store. They are very simple to make and even easier to eat. Our tiramisu was two layers of ladyfingers, which had been soaked in coffee and Frangelico, topped with mascarpone/zabaglione filling and dusted with Valrhona cocoa. It was fun, simple, tasty and satisfying. Posted by Sam at 10:20 p.m.
Mmmmmm....looks delicious! I may have to make one this weekend (or maybe even sooner)! It's awsome that the ladyfingers are made from scratch too! Thanks for visiting. It really is the little things in life that seem to make me happy. Good luck with the tiramisu, I'm sure it will be awesome! And don't forget the liquor!